Hammond Benefit Dinner Remembering One Year | RANGEfire! 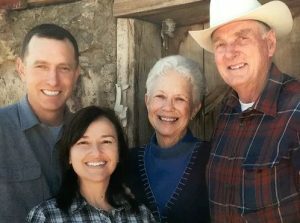 Some Important Reminders about the Hammonds, including Trent Loos’ interview with Ammon Bundy from one year ago on Loos Tales and an interesting interview with Susie Hammond about her family’s changing perspectives about Bundys and the Oregon Standoff. This is a also both an announcement and reminder about the Hammond Benefit dinner at the Burns Elks Lodge, in Burns, Oregon, on Saturday, January 7th from 3:00 to 9:00 PM. Please support the Hammonds the way they have always supported Harney County and the Southeast Oregon ranching community. BURNS — A knock on the front door awakened Susie Hammond at the break of dawn. She struggled out of bed, hobbled by an aching right hip, and limped to the front of her small house in downtown Burns. Whoever it was, she thought, must be someone she knew because of the early hour. As she neared the door, all she could see was a large shadowy figure blocking the light that usually streamed through its glass panes. She unlocked the bolt and opened the door to find two men standing on the stoop. So began Hammond’s passage from 75-year-old matriarch of an eastern Oregon ranching clan to reluctant symbol of the rural West’s revolt against federal ownership of vast resource-rich rangeland. The Hammond name became a mantra for Bundy as he moved into Oregon and seized the Malheur National Wildlife Refuge last winter in a 41-day takeover that captivated the nation with its cowboy ringleaders, armed followers and impassioned protest message. Bundy often invoked the story of Hammond’s husband, Dwight Jr., and their youngest son Steven, convicted of setting fires on public lands and ordered back to prison to serve out five-year sentences. He saw their prosecution as the perfect example of federal authority run amok. Susie Hammond wasn’t equally enamored of Ammon Bundy. Her family didn’t invite his attention and didn’t want it, she said in her first extensive interview since Bundy launched the surprise occupation on Jan. 2 — about two months after he first appeared at the Hammonds’ front door. She worked to keep her distance, shunning Bundy’s requests that her family publicly stand with him as throngs of militants descended on Harney County and set neighbor against neighbor in a fierce debate over control of public land — all under the eye of FBI agents who set up a command center at the tiny Burns Municipal Airport. The Hammonds had their own troubles to handle without picking a fight with the very people who controlled their future, she said. Yet over the past year, Susie Hammond has changed. She’s come to appreciate Bundy’s stand and populist politicking, if not his push to draw her family into his cause. She recognizes that his family’s fight over cattle grazing rights in Nevada has parallels to her own family’s conflict. She’s tracked Bundy’s arrest, trial and acquittal from afar. Ammon Bundy has a way of “worming his way into your psyche” as she put it. Hammond lives alone, forced to leave the ranch she called home for half a century to be closer to doctors and the hospital as she recovers from hip surgery. A tall, thin woman with short-cropped white hair, she had expected at this age to retire with her husband, turn management of the ranch over to the next generation and spend the rest of her years on the family’s far-flung property. Now, she wonders if their legacy and livelihood will survive. While her ailments and the absence of her husband and son have dimmed her spirit, they haven’t dulled her feistiness. Her distaste for the federal government remains as sharp as ever and she’s not shy about sharing her thoughts, often throwing in some choice words to make her point. Fed up with the criminal justice system, the Hammonds look to the executive branch to grant them mercy. Late last month, Dwight Hammond Jr.’s lawyer filed a clemency petition to reduce his federal sentence. His son’s petition is expected to follow soon. “What are you doing here?” Susie Hammond asked as she let Ammon Bundy into her home on the cold, dark morning of Nov. 5, 2015. Dwight and Steven Hammond were gone, moving cattle from the ranch to a feedlot in Idaho to prepare for their scheduled return to prison in two months. Susie Hammond knew about Bundy only from what she had read in newspapers about him and his father, Nevada rancher Cliven Bundy, and their showdown with federal rangers in Bunkerville, Nevada. As Ammon Bundy took a seat in her living room, he handed her a letter and a business card with his name on it. He told her he’d driven the night before from his home in Emmett, Idaho, had “prayed about this all night” and wanted to hand-deliver his proposal. Hammond sat on a brown leather recliner, her back to the living room window. Bundy grabbed a chair to her right. His friend, Ryan Payne, sat to her left, a pistol on his waistband. Unlike his mother, Rusty Hammond supported the Bundys from the start. He marched with the protesters in Burns and sent food to the refuge occupiers. 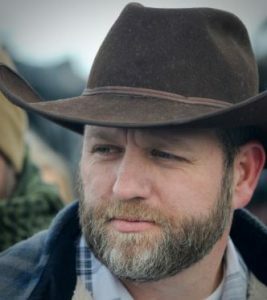 He was called as a witness by the Bundy defense at their trial, testifying that his father was threatened by the government for his contact with Ammon Bundy. Susie Hammond closely tracked the Bundy trial in Portland. The trial offered a window into the obstacles ranchers face, she said. Arrogant federal bureaucracies that brush aside local voices, break promises and ignore or impose rules because they can. That hasn’t happened, she acknowledged. Hammond Ranches is in the middle of appealing the land bureau’s refusal in 2014 to renew the company’s 10-year grazing permit. When Hammond saw an online post Oct. 27 that a jury had acquitted Bundy, his brother, Ryan, and the five co-defendants on conspiracy and weapons charges, she immediately checked with her oldest son. “I had to call somebody and ask them if I was crazy, if I heard that right,” she said. Then the phone didn’t stop ringing, she said. She doesn’t believe what the Bundys did was a crime. They didn’t do much harm to a refuge that’s “frozen over” and not very busy in the winter anyway, she said. But she didn’t expect the criminal justice system to agree. She wonders how the Bundys will fare in their federal conspiracy case pending in Nevada. “The government never lets go of you,” she said. Still, she’s thankful the Bundys are no longer in the county and the national glare has moved off Burns. The occupation left behind a still-shuttered refuge headquarters and visitors center, an exodus of refuge workers and a county still locked in an economic downturn. She has no idea how the Portland verdict may affect her husband. But she expects the changing political climate led by President-elect Donald Trump can only help. READ THE WHOLE STORY . . . about how Susie Hammond’s views about Ammon Bundy and his actions have changed over the course of the past year. Government needs to stay out of people’s business and run the Country not people of the United States. My husband and I are being railroaded by our county’s animal control taking 6 horses off our property 4 of which had resently been bought from the local Auction. We offered to show our records and vet bills to no avail…. They now want over $40,000 for boarding the animals and we still haven’t even had a preliminary hearing to show probable cause and it’s been almost 2 years. They did not follow state law and couldn’t produce a warrant when asked yet I was arrested for asking to see the warrant before allowing them back on my property a 2nd time. We have filed a Federal Civil rights Lawsuit against Knox county but we’re wearing thin. Please contact us with any suggestions or recommendations you might have and we could sure use your Prayers.